MAYER, MN – LaVerne Graham, 94, of Mayer, formerly of Mound, died Thursday, April 4, 2019, at The Estates of Delano in Delano. There will be a memorial service Wednesday, April 10 at 11 a.m. at the Johnson Funeral Home in Waconia, with interment at Our Lady of the Lake Catholic Cemetery in Mound. A gathering of family and friends will take place at the funeral home one hour prior to the service. Arrangements are with the Johnson Funeral Home of Waconia. SPONSORED POST - Starting Friday, April 12 until 11:59 p.m. on Sunday, April 14 Winstock is removing all processing fees for online orders! Make sure this is on your calendar so you can come and see Jason Aldean, Old Dominion, Kane Brown, Brett Young, and so many more perform live June 14 & 15! New this year – Please visit the FAQ page on the website for answers to some of the most commonly asked questions about the festival. If you don’t find your answers there, please email winstock@winstockfestival.com or call 320.485.4287. 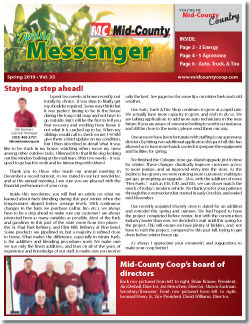 Mid-County Coop’s Spring Newsletter is here! See all the new updates in all the departments at Mid-County Coop. Also, visit https://midcountycoop.com/messenger/ to see all the past newsletters going back to spring of 2006! Hutchinson Health is growing to give you more. The partnership between Hutchinson Health, HealthPartners and Park Nicollet gives you access to more of the best care. In the last year, Hutchinson Health made major changes in Hutchinson. They opened Hutchinson Health Cancer Center and expanded Hutchinson Health Urgent Care. Hutchinson Health wants families to have convenient access to essential care and services. More changes are coming in 2019. This year Hutchinson Health is adding new specialty services, including plastic surgery, pulmonology, rheumatology and more. They’re also adding a new wing with more patient rooms for medical and surgical inpatient care.